LWA - Value Tech Ltd. The Liebherr water treatment plant called LWA is used when recycled water cannot be used for concrete production. 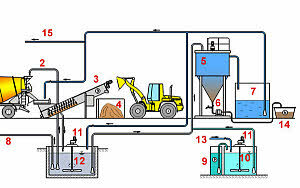 Recycled cement water will be cleaned is a sewage tower with flocculant agent. Clear water can be re-used for different purposes.